BY THE TURN OF THE FIRST MILLENNIUM, pagan forms of burial had been abandoned in Denmark. Christian teaching about life after death must have been persuasive. Missionaries objected to elaborate pagan burial rituals in which some graves were furnished with valuable goods, even ships, and covered by huge mounds. They urged instead that gifts should be made to them as “payment” for future prayers on behalf of the dead. This was an enormous breach with custom; the rituals of pagan burials were not only for the sake of the dead but also a means of demonstrating the wealth and status of the survivors. With burial mounds gone (and before church yards became the natural places for memorials), rune stones provided a way of displaying wealth and status while honoring the dead. Such monuments flourished in western Scandinavia in the late tenth and early eleventh centuries, while in eastern Sweden, they became popular later and continued into the twelfth century. Inscriptions on these stones show the personal side of conversion, especially the place of women in the conversion process; one inscription erected by two men in memory of their father and mother ends “May God now help her soul well.” It was obviously their mother, not father, who had converted. There are many indications, in fact, that women outnumbered men among early Scandinavian converts. Most of the early Christian graves at Birka, for example, were of women, and most of the runic monuments commemorating men who were converted in their last days, who had “died in white clothing,” were erected by women. Another inscription, from the eleventh century, commemorates a woman who planned to make a pilgrimage to Jerusalem. The c.145 inscriptions that refer to bridge building (missionaries often suggested building a bridge or causeway “over deep waters and foul ways for the love of God") confirm the leading role of women in the conversion period. A surprisingly large proportion of these inscriptions were commissioned by or erected in memory of women. 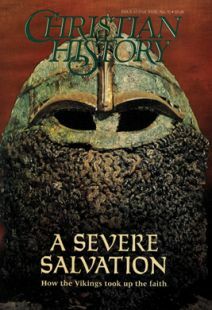 Birgit and Peter Sawyer are the authors of Medieval Scandinavia (University of Minnesota, 1993) and editors, with Ian Wood, of The Christianization of Scandinavia (Viktoria Bokförlag, 1987). Chronology of some events related to the conversion of Scandinavia. The stories of three Viking rulers and their encounters with Christianity. The story of Erik the Red, his son Leif (the famous explorer) and the most misnamed of Viking Islands. The conversion of Sweden is unspectacular—and for that reason most illuminating.